Blogging and working out are very similar in that if you stop doing either, the longer you wait to get back into the routine, the harder it is to get started again. I've been reading so many great books lately and since two of them were written by friends and published this month, I want to send some positive vibes about them out into the world. 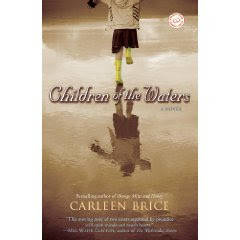 I will dedicate separate posts to each of these fine books this week, but for now let me recommend This Lovely Life: a memoir of premature motherhood by Vicki Forman and Children of the Waters, Carleen Brice's second amazing novel. For now, I'll just say that both books touched me deeply and on a very personal level and I'll talk more about that and about these gifted writers and wonderful people when I post about each book. "Last, by by no means least, I have the titans. The long, hard tomes that I'd like to read for one reason or another. I suspect I'll save and tackle these big guys for vacations or in case I end up in a body cast and incapacitated for months on end. I'm very interested in hearing from anyone who has read any of these books. I can see this picture doesn't show the titles well, so they're: Gravity's Rainbow by Thomas Pynchon, The Recognitions by William Gaddis, Cloud Atlas by David Mitchell, Swann's Way by Marcel Proust, All four Rabbit Novels by John Updike and Infinite Jest by David Foster Wallace." I'm pleased to say that I've read the first three volumes of In Search of Lost Time, by Marcel Proust and I've finally been given the incentive to start Infinite Jest by David Foster Wallace. In early June, Matthew Baldwin launched Infinite Summer an online campaign challenging This Lovely Life and Children of the Waters. 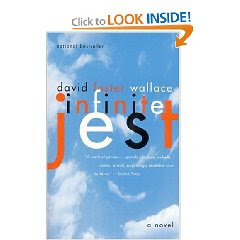 David Foster Wallace, who was known for his essays, short fiction and novels was probably best known for his 1996 masterwork, Infinite Jest . I, like many of the other readers to tackle Wallace's 1,079 page novel between June 21st and September 22nd. At roughly 75 pages a week and with participation estimated at more than 2,000 readers, the idea of taking on the massive work is far less intimidating. Since I'm a huge cheater, I started the week before but did stop twice to read Infinite Summer participants had read much of his shorter work and had purchased Infinite Jest with all good intentions to read it. Many of those reading it now had started it once or twice before, but had never finished. I suspect most readers were like me and after flipping through the densely written, heavily end-noted monster decided that a book like this would need time specially set aside for it. Social networking has really enhanced the "we're all in this together" feeling of this summer read with over 2,500 people following Infinite Summer on Twitter and over 4,000 members on the Infinite Summer Facebook group. As of this evening, I'm on page 395 and after admittedly battling through the somewhat disorienting, yet captivating first two hundred pages, I am on board and strapped in for the ride. I've never read anything quite like this and sadly, neither I nor anyone else ever will again. Certainly, Wallace's tragic suicide after a lifetime battling clinical depression has given this project a bittersweet edge. I have a whole list of books I've read since the last time I posted and I want to hear about what you've all been reading. How are you? I've missed you guys.